In 1981 Peter Allen was an international superstar. He had been a frequent visitor to Canberra, performing, attending events and even adding his own special brand of pizzazz as the ‘Prince of the Mardi Gras’ parade for Canberra Day in 1980. 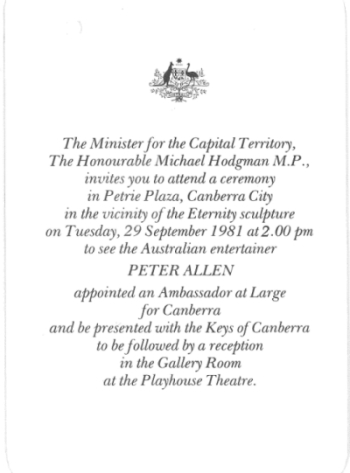 In recognition of his ongoing engagement with our city, the then Minister for the Capital Territory, Michael Hodgman decided to hold a public ceremony in Petrie Plaza to proclaim Peter Allen the first ‘Ambassador for Canberra’ and present him with the ‘Keys to Canberra’. This privilege had never been granted before, and local public servants had to research and develop appropriate materials, including speeches, official scrolls and of course designs for keys. 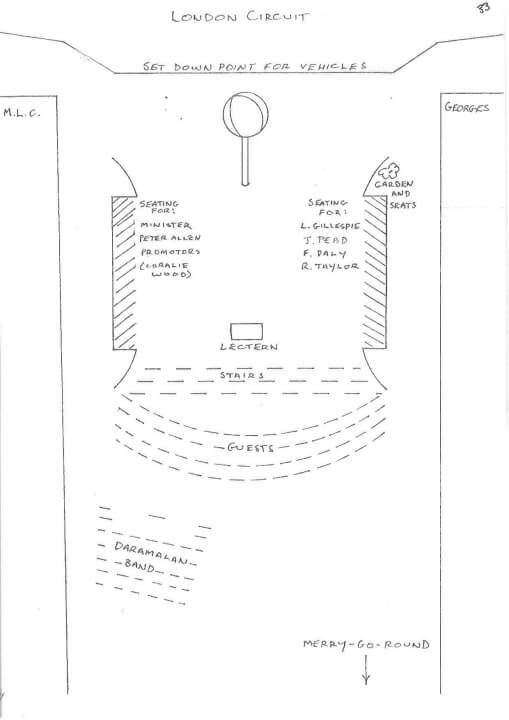 The official function also required planning. This was complicated by a commercial collaboration with a local radio station. Finding the right balance between the gravitas of a government ceremony and the less formal approach of a community station was challenging. With the onset of the festive season, we would like to wish you all a happy holiday. We hope you will enjoy some holiday reading with ArchivesACT’s December Find of the Month which explores records regarding the naming of our first Ambassador for Canberra, entertainer Peter Allen. 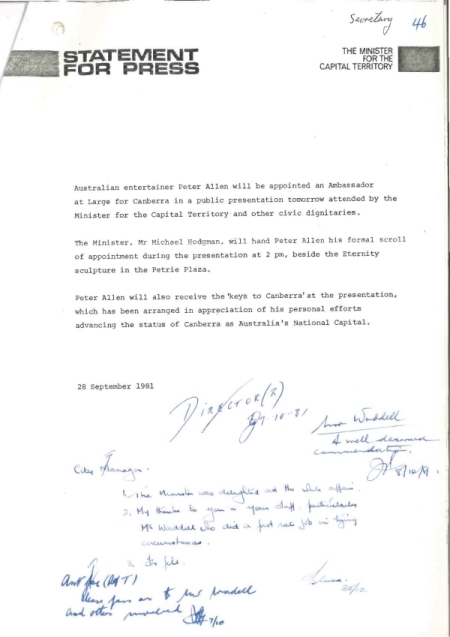 The discussion behind the decision to name Peter Allen as an Ambassador of Canberra and to grant him Freedom of the City is unfortunately not held in our records. 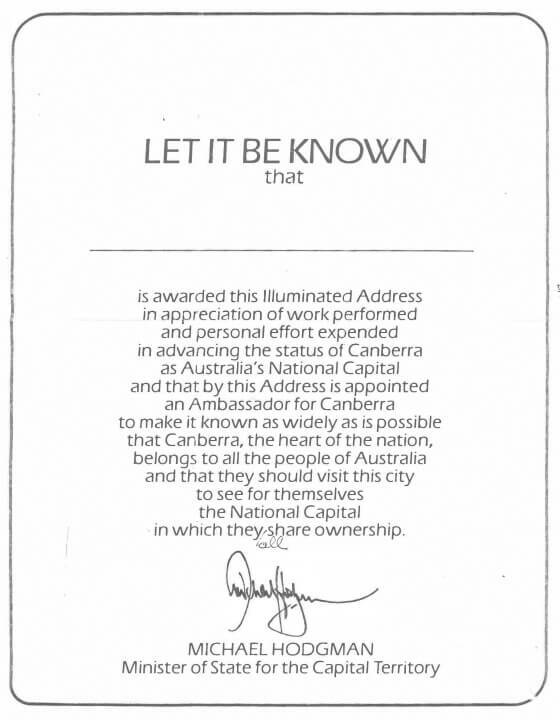 In 1981, the Minister for the Capital Territory Michael Hodgman was already the subject of public criticism for his previous handing out of the ‘Freedom of the City of Canberra’. First came a heated debate over his decision to recognise the RAAF (RAAF Fairbairn) over the Army. Then questions were raised over the principle of a non-resident being allowed to hand out freedom to a city he did not even reside in. For although Hodgman represented the ACT, this was purely a political post, and he was in fact a long term resident of Tasmania. The decision to name a popular entertainer an Ambassador for Canberra would have provided Hodgman with some much needed local approval. Peter Allen was an active and frequent visitor to Canberra who had also freely given his time to the 1980 Mardi Gras, and had even chosen to unwind afterwards at the Food and Wine Frolic, mingling with the locals and enjoying a concert in the park. In 1981 he was at the height of his fame, his Broadway show was a success and he had just released his highest grossing record, Bi-Coastal which included hits such as ‘One step over the borderline’ and ‘I still call Australia home’. Hodgman embraced the idea with enthusiasm, even giving a radio interview committing to personally presenting a key to the city to Peter Allen well before planning for the ceremony was properly underway. With less than a month to prepare for the event, the Recreation Section from Canberra Tourism were under pressure to research and deliver an appropriate event to mark the occasion. Although the Freedom of the City had previously been granted, this was the first time that an ‘Ambassador for Canberra’ had been chosen. Advice was sought from protocol officers in other jurisdictions and a program, invitation and guest list were quickly drafted. The program for the day included a public ceremony, co-hosted by local radio station 2CC. Musical entertainment prior to the event was provided by the Daramalan Band who performed “I still call Australia Home” as the guest of honour arrived. 2CC provided publicity, and escorted Peter Allen to and from the venue. 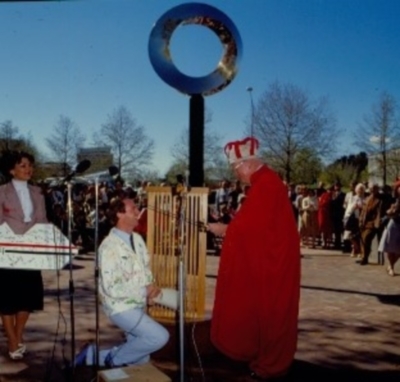 The station also arranged for former Minister Fred Daly, who had already been made the ‘King of Canberra’ as part of the 1981 Canberra Festival, to t present a second ‘people’s key’ to the singer at the end of the official ceremony. Immediately following the public event, a private reception was held at the Canberra Theatre for around fifty VIPs including politicians, local business leaders and members of the media. The key was to be chrome plated and engraved with unrecorded wording. It was manufactured by a Belconnen locksmith for the sum of $70.00. While the Minister was behind the idea of presenting keys, the Secretary wanted an official Scroll of Appointment to be presented and read out at the ceremony. The ceremony went off without a hitch, albeit with some frivolity. Hodgman denied that the keys were for unlocking the Garema Place toilets, joking instead that they were for the Treasury. Not to be outdone, Fred Daly announced that the people’s key was good for a night at the Lodge. Daly then asked Peter Allen to kneel and dubbed him ‘Baron of Belconnen, Master of Black Mountain and Admiral of the Central Basin’. 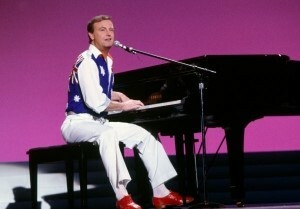 Do you have a favourite Peter Allen song? Ready to start your own research? Contact us through our Request a Record service and we will be happy to help.